Could a condo boom be coming to Dupont Street? Dupont might be the street du jour with developers, restaurateurs and gallerists looking to build up what was once a predominantly industrial street. Construction of Fuse Condos is already well underway, which will soon bring 23 and 27 storey towers to Dupont and Lansdowne, but the portion of the street to the east could also see a major injection of density. Might, however, is the key word. 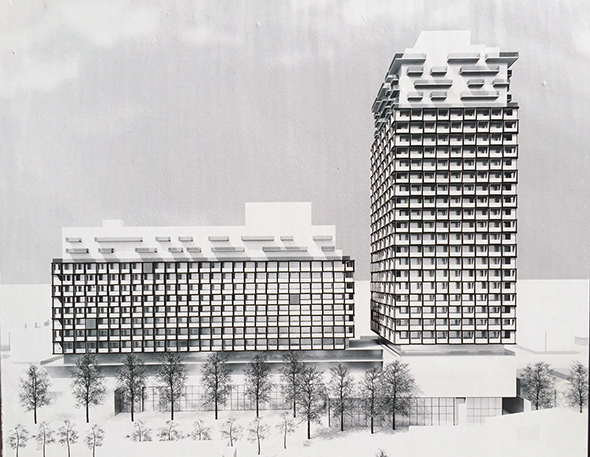 The idea of a large scale development on the north side of Dupont just west of Spadina has been floating around for at least eight years, but the Wynn Group was never able to get approval from the city. That's because the north side of Dupont from Kendal to Ossington runs directly in front of a busy Canadian Pacific Railway line. And, this stretch of land used to be zoned as as an employment area; meaning residential buildings weren't permitted. Now, as noted in a CBC report, they're allowed, but, according to the city, they must be set back 30 metres from the rail corridor and can be only mid-rise. Still, the prospect of a large scale development here just won't die. 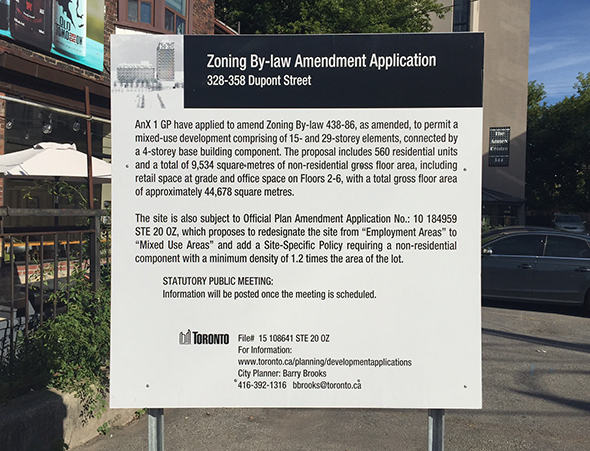 Earlier this year, Freed Developments took interest in the site and submitted a rezoning proposal, which included plans for two condo towers at 328 Dupont, rising 15 and 29 storeys high. This project would bring a total 560 residential units to the area. It's a modification of the original Wynn plan, but every bit as dramatic. Sobeys also has a development in the works at Dupont and Shaw, where it currently has a grocery store, for two 11-storey condos or 393 units. Both of these projects are currently being appealed to the OMB, but don't expect an answer for quite some time. There are real concerns that Dupont isn't well built for such an injection of density, though in the case of the Freed proposal it's hard to argue against building residential high rises so close to the subway and surrounding amenities. While the stretch of Dupont east of Lansdowne remains condo free for now, don't expect this to be the case in the next decade. With the residential zoning amendment in place, developers are plotting out the next phase of the street, one that will transform it thoroughly. What do you think of the changes that may be coming to Dupont Street? Let us know in the comments.